Emotional Intelligence: what is it and how can it contribute to increase organizational performance? 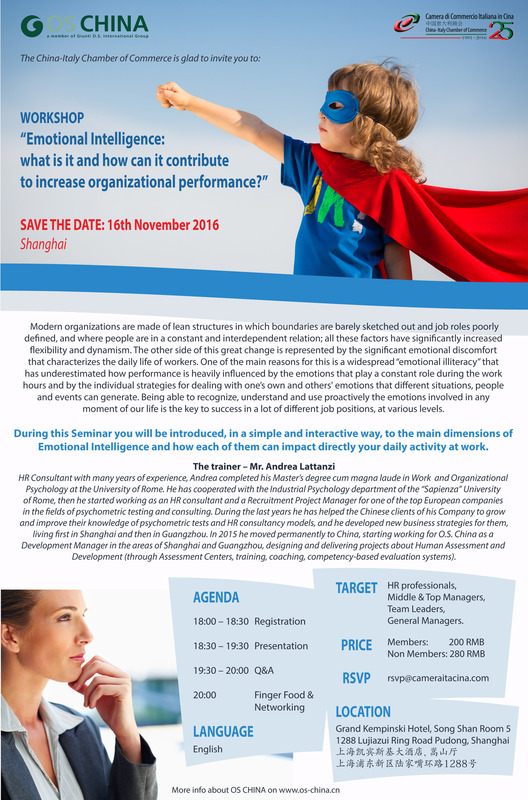 "Emotional Intellingence: what is it and how can it contribute to increase organizational performance?" HR professionals, Middle & Top Managers, Team Leaders, General Managers. During this Seminar you will be introduced, in a simple and interactive way, to the main dimensions of Emotional Intelligence and how each of them can impact directly your daily activity at work. At the same time they provide a wide range of solutions for individuals, such as: coaching; training; certification courses on the most popular HR psychometric tools; vocational guidance; competency balance. All the projects can be developed/delivered in English, Chinese and Italian.